Chico River Quest in Kalinga province, the Home of the Mighty Chico River! The Chico River is considered the umbilical cord or River of Life for the Kalingas. Its headwaters emanate from Mt. Data and span the whole of Central Kalinga. It is the home of the Kalingas. From the First Put-In In Tinglayan to the Tabuk Take-out is approximately 72 kilometers. It is one river that united the whole of the Cordilleras in opposition to development aggression. It may be recalled that in the early seventies the Chico River was supposedly the site of one of the biggest hydroelectric dams in Southeast Asia. The Kalingas however successfully opposed the project. The opposition to the hydroelectric dam dramatized the struggle of the indigenous peoples to be free from development aggression and for self determination. To the Kalingas the Chico River is popularly called "KAYAKAYAM" which means crawl but it was given the name Chico Rio by the Spaniard to differentiate it from "Rio Grande of the Cagayan". The Chico River Quest offers open schedules for trips throughout the year. All trips include river shuttles, food and accommodations, Kalinga guides, fabulous scenery, exhilarating rapids, and a glimpse of Kalinga culture. 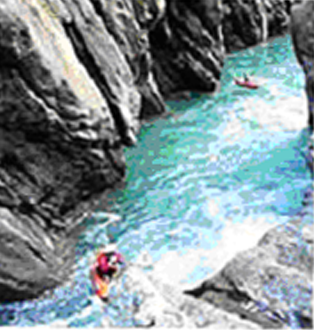 Whitewater Rafting in Kalinga can be done throughout the year and is ideal, from June through early January, with other dates possible dependent on water level.